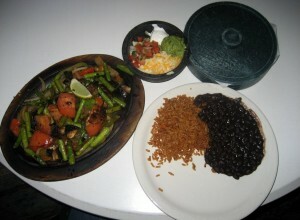 Vegetable fajitas, served with guacamole, sour cream, pico de gallo, cheese, lettuce, and corn or flour tortillas. For you vegetarians out there, Oasis only has three options on the menu and we ordered two of them. Those of you that like vegetables and large portions (big enough to serve 2+), will love this dish. 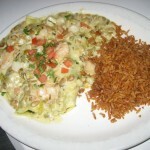 It comes with a variety of vegetables including: tomatoes, bell peppers, onions, asparagus, and mushrooms. Combine it with all the sides and you have the makings of a delicious dinner. The two complaints we have about the dish is that there was no fajita-like flavor to the vegetables and the asparagus was noticeably harder than the rest of the vegetables which gave it an inconsistent feel. Adding lots of salsa definitely made this more enjoyable. Fresh seafood (shrimp, scallops, crawfish) sauteed in green chile chablis, draped over pepita spinach crepes and served with Spanish rice. Being crepe lovers, we had high hopes for this delicious sounding dish (and for the $20 price tag). Based on the picture, you would think crepes are creamy, rich, and flavorful right? Wrong! This dish has absolutely no flavor except for the overbearing spinach. We don’t know what that white sauce was made out of, but the only thing it added to the dish is calories. The amount of shrimp, scallops, and crawfish were adequate and had good texture, but also had no flavor. Stay away from this dish! 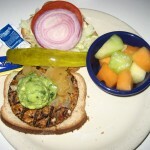 Grilled vegetarian patty on toasted wheat bread with fresh fruit and guacamole. The burger comes with lettuce, tomatoes, onions but if you want cheese, grilled onions or mushrooms, you must add $1.25 each! The patty contains soy and black beans and is quite flavorful – similar to the one at Chili’s. However, when you put it between two slices of bread it becomes very dry, requiring lots of ketchup and mayonnaise. Instead of spending $10-$12 on this little thing, spend a few dollars more on the fajitas. We dined at the Oasis on a weekday evening and were surprised at how many patrons were dining here. Luckily, there was no wait and we were promptly seated at an outdoor table overlooking the beautiful Lake Travis. We were given the menus and served water right away, but when asking for one without ice, it took another 20 minutes and we flagged down another waiter to get it. It was also at this time that we finally had the opportunity to order. We had two different waiters and they seemed friendly but were always rushing. The food came out in a timely manner and our requests for ketchup and salsa were fulfilled quickly. The Oasis was built for customers to relax and enjoy the peaceful nature, and their service coincides with this – laid back and unobtrusive. The Oasis, located 450 feet above Lake Travis, is one of Texas’ most famous restaurants. It is known for breathtaking views of the sunset amongst the hills, canyons, large homes, and the beautiful lake. The restaurant is enormous with multiple levels and several indoor areas and outdoor decks. The seating capacity is an astonishing 300, but seems even larger. The dining areas have an upscale-y Southern vibe, yet simultaneously casual feel to them and large enough for private events. This is a great place to visit once, especially if you are entertaining out-of-town guests. The food here is below-par and is overpriced so you might just want to share one appetizer and eat a full-meal somewhere else. There is plenty of parking, but be prepared to walk a bit on unpaved gravelly roads. totally. all about the ambiance here. food is bland. i go for view and margaritas! !